Beautifully updated 4 bedroom, 3.5 bath Villa w/ over 4,100 sq. 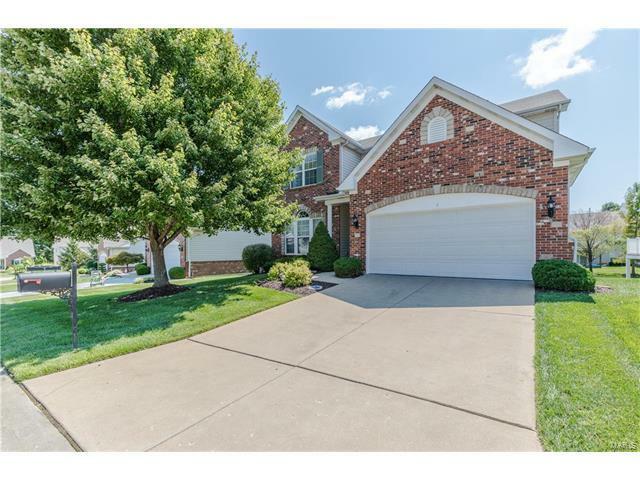 ft. of living space in the desirable Carrollton Manor gated subdivision in the heart of St. Charles. You will love the open concept on the main level & the contemporary feel when you walk through this home. The kitchen shows like a display w/ its granite counters, stainless steel appliances, hardwood flooring, 42 inch cabinets, separate walk-in & butler's pantry, breakfast bar & updated lighting. The spacious great room is perfect for entertaining & is accented w/ a gas fireplace. The professionally finished lower level will surely impress w/ a large rec. area, add. bedroom, full bath, office & plenty of storage. The master bedroom suite features a sitting area, large walk-in closet & beautiful master bath. Add. features include high efficiency 90+ furnace, new A/C, irrigation system & main floor laundry. All nestled in a care-free living subdivision where HOA covers lawn care, snow removal, gated access and much more! Interstate 70 to west on Zumbel, make a left at Hawks Nest (Walgreens on corner) and then a right into Carrollton Manor subdivision. Make a right on Eagle Crest and home is on left.